Head out to your favourite trails aboard the Orange Five Pro. This full suspension trails bike has a British built alloy frame with a single pivot design. Fox shocks are found front and rear, controlling the 150mm front and 140mm rear travel, giving you the ability to push your limits in a wide variety of terrain. 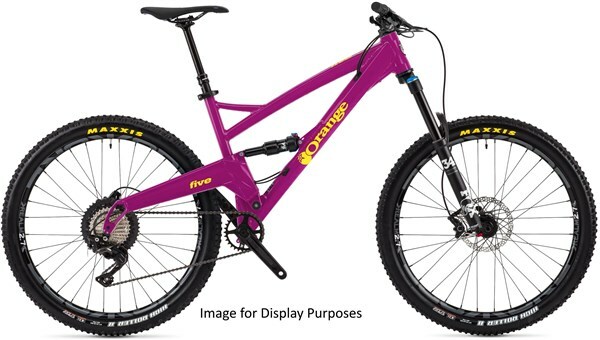 Hit the trails or even try your hand in some enduro races with the Orange Five Pro. Contact us about customisation options for your Orange bike! The hardworking Five has been a stalwart of the Orange range for a long time. It’s tough, reliable and capable. The harder you push it the happier it seems to be. So, we better make sure we don’t mess with it right? Fork: Fox Performance 34 Float, 150mm 27.5"
Rims: Kore Realm 3.0, 27.5"